The Terms Component returns information about indexed terms in a field and the number of documents that match each term. Terms component, directly uses Lucene’s TermEnum to iterate over the term dictionary, so retrieval of terms document frequency, with Terms Component is much faster than iterating over each document in the index, finding distinct terms in the field and calculating their document frequency. Example: To get top 10 Terms in the field, ordered by their document frequency. 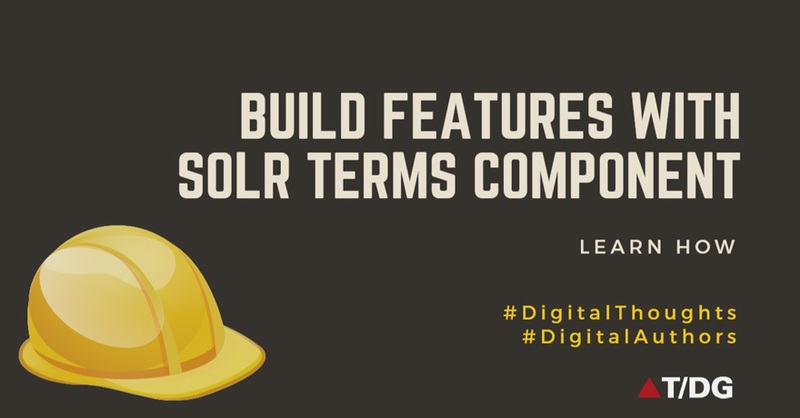 The Terms Component can be useful for building any feature that operates at the term level instead of the search or document level. Some search applications provides list of fields to user, on which he can perform search. Now user knows, what all fields in the index are available for search and this available number of fields for search, can be large sometimes more than 20. If user wants to search term “heart” on limited number of fields, then for that he should know what all fields in the index contains “heart”. To help user, to find fields containing, “heart”, the site can provide Browse index feature to user. User will submit “heart” and Browse index feature should list down all fields in the index containing “heart” along with number of document that have “heart” in that field. For example for “heart”, Browse index feature should return information, as shown below. Once user knows which fields contain “heart” and its document frequency, then he can refine his search, by limiting his search for “heart” in restricted fields. Thus while constructing above query, Browse index feature should append, &terms.fl for all the fields in the index, that are available for search.